It will be a few more years before she's caught with her nose in a book, but your baby girl is already more like Disney's Belle than expected. First off, she has full-blown conversations with inanimate objects. Sometimes you wonder if the feather duster is actually alive because she spends hours babbling to it, the same goes for the wardrobe, candlestick, and teapot. (Mrs. Potts, could it really be you?) You often walk into the living room to find her petting the leather foot-stool like a dog and to calm her before bed the classic Disney song, "Tale As Old As Time" needs to be played at least a half-dozen times. 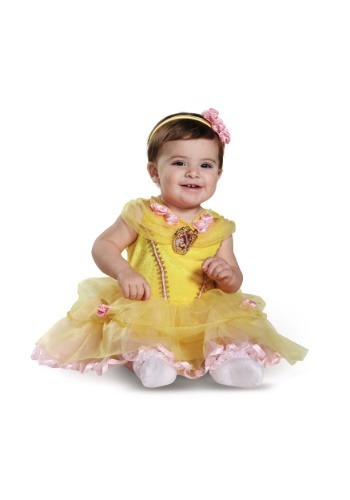 How do you dress a baby girl who's so enchanted by Belle and her magical castle friends? In an officially licensed Princess Belle dress, of course! Specifically tailored for infants' tiny bodies, this Disney costume will make her eyes light up and provide endless photo opportunities for you! Perfect for attending the Magic Kingdom or your town's annual Halloween costume parade, this costume comes with everything needed to create the look pictured here. The yellow dress is modeled after Belle's iconic gown from the ballroom scene, complete with gold trimming and pink rosettes. The garment fastens via a hook and loop closure at the back of the neck. A picture of Belle on a broach is attached to the front and layers of tulle make up the dress's bottom. The stretchy headband has detachable rosettes matching the ones on the dress perfectly. Good news mom, we have an identical costume in your size so you and baby can match. Include the whole family and get dad in on the Disney fun too. We all think he would make a great Beast, don't you?